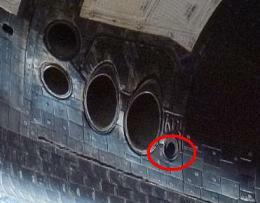 As engineers create their repair plan for what is now observed to be two cracks in Atlantis’ left radiator panel, borescope inspections have been called (see update in article) on both Atlantis and Endeavour, after a broken stud was found on Discovery’s Forward Reaction Control System (FRCS) F5R thruster. Meanwhile shuttle managers have created a contingency plan for the STS-125 crew, due to the threat of Swine Flu. At present, managers are only pre-empting a potential outbreak of Swine Flu in the Houston area, by creating a plan that would see the STS-125 astronauts being placed into quarantine as early as this weekend. “Due to concern with the Swine Flu, the crew doctors are considering putting the crew into quarantine early,” noted the Flight Crew/Astronaut Office via the latest Shuttle Stand-up/Integration report on L2. From a SSP (Space Shuttle Program) standpoint, no restrictions have been placed on the travel plans for managers and engineers, a large number of whom have travelled to Florida for Thursday’s STS-125 Agency FRR (Flight Readiness Review) at the Kennedy Space Center. “Regarding the flu, and the concerns that have been in the news, we do have a lot of folks planning to travel this week and there are things going on around the Program,” added Mission Management Team (MMT) chair Leroy Cain on the Stand-up report. “As a Program, we do have plans in place for these kinds of eventualities, so if you have concerns about travelling please let us know. We don’t see any reason at this point why we should keep folks back from travelling, but if you feel otherwise or if you think there is something going on that we should be aware of please don’t hesitate to let us know. Processing remains on track – pending the resolution of two issues (noted below) – with the highlight of the pad flow on Tuesday being the installation of the three Flow Control Valves (FCVs) on Atlantis. 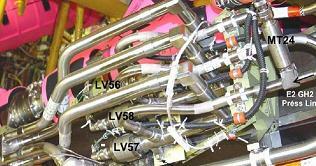 The valves were installed into their housing during Tuesday, with mass spec leak checks already passed. Engineers are now working the electrical retest procedure. “HST SM-4 Interface Verification Test (S07125) is scheduled to complete Thursday,” added processing information on L2, outlining other work being conducted on the pad flow. “S1287 Orbiter Aft Closeouts continue throughout the week and conclude with the Aft Confidence test, planned for Monday, May 4. “The EMUs (EVA Mobility Units) were installed; testing begins Tuesday. GO2 check valve R&R (GO2 battery) in work after leak in check valve was noted. LO2 tank replenishment with two waves of tankers was completed Monday. Following the incident involving an impact on Atlantis’ left radiator panel from a torque wrench socket – which caused two dents in the face sheet in the 0.011” thick aluminium face sheet and subsequent observation of a crack – engineers have been working on a repair plan. While that plan is now set, it appears there are two cracks on the radiator, both of which will undergo the same repair procedure. “After a discussion with the engineering community, approved a plan to perform the standard repair at the pad which is complete removal of the damaged area, install a plug and doubler,” according to engineering notes on L2. “The Hubble M&P engineer and the Vehicle manager were both consulted and approved the plan. 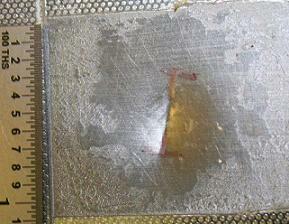 The plan is to remove the face sheet, followed by work on the honeycomb core – which will be straightened. If this is not possible the core will be removed and a honeycomb plug will be bonded in place. The surface will then be prepared for the bonding of a double face sheet. This will require six hours of elevated temperatures via heated blankets over the area to cure the repair. The entire procedure will be carefully controlled to avoid contamination of the critical Hubble payload components. “Two plugs will be made one 1 3/8” in diameter and the other 1” in diameter. The doubler will go over both plugs. The paper should be written and approved by Wednesday and the work should start by Thursday,” continued engineering notes. A second crack was observed via additional photography – acquired by L2 – that was taken at the pad this week. Both cracks are less than an inch in length. Despite the second crack being found, the plan remains intact to support the May 8 target for Payload Bay Door closure, which in turn will not impact the launch date target of May 11. Also noted by OPO engineers last week – and reported by this site – a concern was raised on the incorrect installation of studs – one of which was broken – relating to the FRCS F5R thruster, found during post STS-119 processing. That investigation has resulted in a call to check the identical hardware on both Atlantis and Endeavour, which will involve two panels being removed from each orbiter, prior to a borescope inspection of the thruster studs for any problems. It is unlikely engineers will find any issues on Atlantis and Endeavour, and given Discovery probably flew a couple of missions with the incorrect configuration of the stud – without a problem during flight – it would take a serious problem with the hardware to result in work being called on replacing the studs. Should managers decide to take that option of replacing the studs, both Atlantis and Endeavour would have to be rolled back for destacking, prior to the completion of remedial work in their respective Orbiter Processing Facilities (OPFs). This, as stated, is unlikely. Borescope inspections on Atlantis will begin on Thursday. UPDATE: Inspections on Atlantis have found no issues with the studs – and thus is cleared for flight. With the Agency FRR meeting on Thursday, the official setting of the launch date will be undertaken. At present no constraints to confirming the realigned May 11 launch date have been noted.